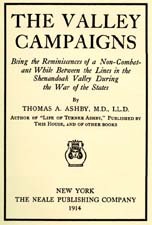 Thomas A. Ashby (Thomas Almond), 1848-1916 The Valley Campaigns: Being the Reminiscences of a Non-Combatant While Between the Lines in the Shenandoah Valley During the War of the States. The Valley Campaigns: Being the Reminiscences of a Non-Combatant While Between the Lines in the Shenandoah Valley During the War of the States. New York: Neale Publishing Company, 1914. Ashby, Thomas A. (Thomas Almond), 1848-1916. Shenandoah River Valley (Va. and W. Va.) -- History -- Civil War, 1861-1865.